Jean Frederic Bazille was a French Impressionist painter best known for his depiction of figures. Born in Montpellier, H�rault, France, into a middle-class Protestant family. He became interested in painting after seeing some works of Eugene Delacroix. His family agreed to let him study painting, but only if he also studied medicine. Bazille began studying medicine in 1859. He moved to Paris in 1862 to continue his studies. 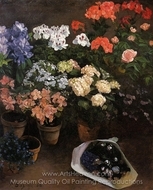 There he met Pierre-Auguste Renoir, was drawn to Impressionist painting, and began taking classes in Charles Gleyre's studio. 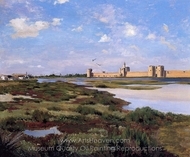 After failing his medical exam in 1864, he began painting full-time. 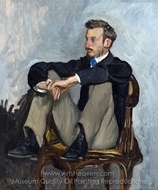 His close friends included Claude Monet, Alfred Sisley, and Edouard Manet. Born to a wealthy family, Bazille helped support some of these artists by giving them space in his studio and materials to use. 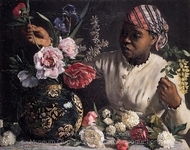 Bazille was just 23 years old when he painted several famous works, including The Pink Dress. His best known painting is Family Reunion (1867-1868). 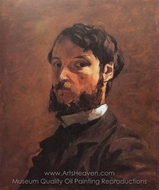 Frederic Bazille died in 1870 at age 29. He was killed in action in Beaune-la-Rolande, Loiret during the Franco-Prussian War.